Scientists Mourn Popular Wolf Shot By A Hunter The wolf known as 832F was taking a rare jaunt outside the boundaries of Yellowstone National Park when she was killed last week. Though her death is a blow to those who followed her story, some say hunting is a necessary part of the future of wolves in the West. 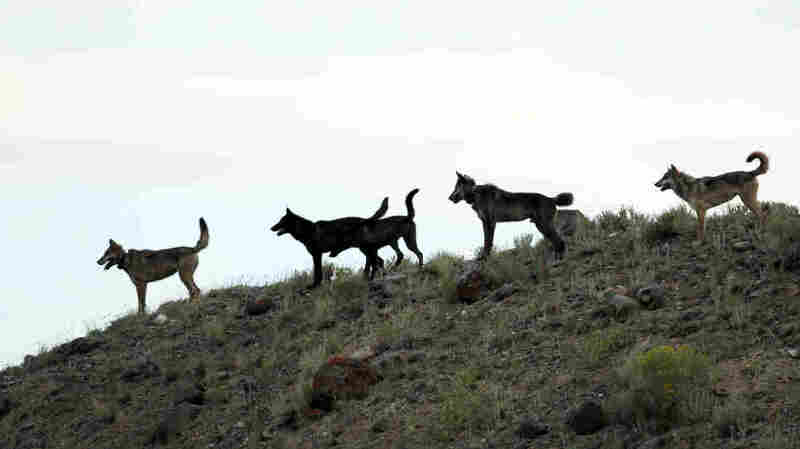 Wolves from the Lamar Canyon pack stand on a hillside in Yellowstone National Park in Wyoming in August 2012. The most popular wolf in Yellowstone National Park was shot by a hunter last week, a big blow to scientists and many wildlife enthusiasts who loved following her story. "She was very recognizable, and she was unique and everybody knew her," says biologist Douglas Smith. The animal known as 832F had a beautiful gray coat and was the alpha female of the Lamar Canyon pack. Smith has followed this wolf for years but only got to put a tracking collar on her in February. "I tried to catch her for several years prior to doing it, and she was so smart we couldn't. We do it with a helicopter, we dart them, we fly in on them. And she used the landscape to her advantage," Smith says. "I watched her. And every other wolf is running, she's watching, figuring out the next move to get away from us." Smith says that's an extraordinary wolf. 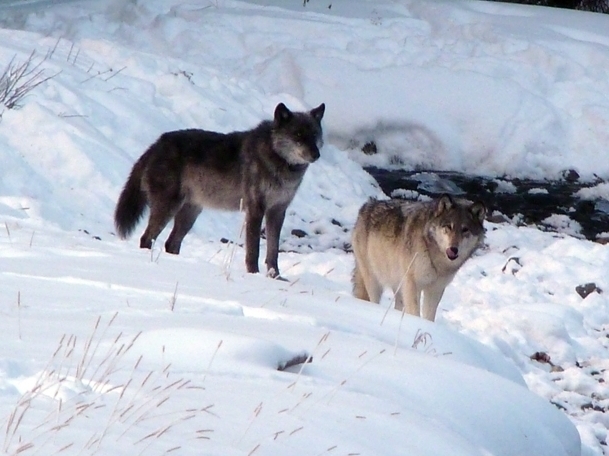 The Lamar Canyon pack's alpha female (right) was shot and killed by a hunter on Dec. 6. "People in this world today crave something real, and our society is lacking that, and they could come to Yellowstone and see real nature unfolding in front of their eyes with this very unique personality of a wolf, and they loved her. They thought it was great," Smith says. Gray wolves were hunted and trapped to the point that there weren't any in the western U.S. by the 1930s. Smith helped to bring wolves back to the park in the mid-1990s and has studied them ever since. He says that closely watching wolves like 832 has taught biologists that they were wrong about the basic way wolf packs function. Alpha females like 832 lead the packs — not the alpha males, as biologists long thought. "She was clearly in charge, and actually, typically males are better hunters than females. That was not true in this case. She was a great hunter, in fact brought down elk by herself single-handedly," says Smith. Wolves were only taken off the endangered species list in Wyoming a few months ago, and this is the first season it's been legal to hunt wolves in all three states bordering Yellowstone. Wolf 832, who was taking a rare jaunt outside park boundaries when she was shot, is one of at least seven wolves from Yellowstone that have been killed in legal hunts this year. Hundreds more out of about 1,800 in the northern Rockies have also been killed. Suzanne Stone, a wolf expert from the environmental group Defenders of Wildlife, says the hunting is too aggressive. "This is not a legacy that anyone would want to have. This was one of the most successful wildlife reintroduction programs anywhere in the world. And it's being put in jeopardy now," says Stone. Randy Newberg hunts wolves and makes hunting television programs. He says tourists love wolves, but many people who live around them don't like them and hate that the federal government forced wolves on them. He thinks wolf hunts are easing the animosity many local people feel toward the predator. "Having these hunting seasons has provided a level of tolerance again," Newberg says. Smith says as much as he hates to lose a wolf as valuable as 832, he agrees. "To get support for wolves, you can't have people angry about them all the time, and so hunting is going to be part of the future of wolves in the West. We've got to have it if we're going to have wolves," Smith says.